Hi there. I’m George, a twenty-six year old guy from London (the British one). That’s me up there with the goofy grin (the other one’s me mum). 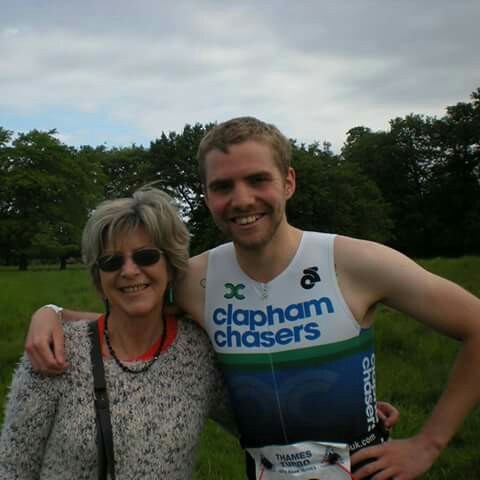 I took up triathlon as a sport at the start of 2015 and kind of fell in love with it. At the time I started this blog, I had competed in two sprint triathlons and a sprint aquathlon (and have since competed in a handful of other events). Not feeling that this was enough to go on, I’ve signed up for Ironman Kalmar 2016. 2.4 mile swim, 112 mile cycle, 26.2 mile run. All in one race on one day. Ambitious, I know. I’ve also suffered through some pretty intense and prolonged bouts of depression throughout my adult life. This has led me to do some pretty dark things. As part of my journey to become an Ironman, I will be fundraising for The Maytree Respite Centre, a charity that did so much to help me when I needed it most. You can read more about this on the Fundraising for Maytree page. This blog is intended to be some kind of consolidation between these two facets of my person: the self-destructive person I was, and how I have turned this into some bizarre unforeseen drive in the present. There may be unpleasant themes presented, but I hope that someone somewhere might be able to take something positive from my strange little journey. For the interested I’m also the author of Poetry Per Day, a blog where I attempt to write a short off-the-cuff poem each day for a year.